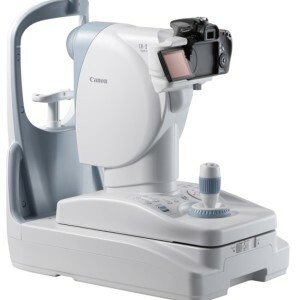 The CX-1 is Canon’s first fully hybrid digital retinal camera with both mydriatic and non-mydriatic modes. With one-touch, the operator can automatically switch between mydriatic and non-mydriatic modes, effortlessly utilizing different functions within seconds and performing several concurrent ocular tests. The CX-1 includes a mydriatic mode and non-mydriatic mode, and each mode can be selected with a single switch. Fundus autofluorescence photography is possible in both mydriatic and non-mydriatic modes. The CX-1 includes a special digital camera using EOS digital technology as a standard accessory.This enables the CX-1 to fully maximize Canon technology for shooting high-quality, high-resolutiondiagnostic images. Panning and tilting functions are provided as standard options in a compact, lightweight design.The compact body makes it easier to assist patients and provides significantly improved ease-of-operation.Vertical movement of the main body by a motorized chin rest and an operation lever significantly improvesalignment operability. The CX-1 can photograph dilated pupils with a diameter of at least 5.1 mm in the mydriatic mode, with 50° of their field angle. It can photograph non-dilated pupils with the diameter of at least 4.3 mm in thenon-mydriatic mode, with 45° of their field angle. 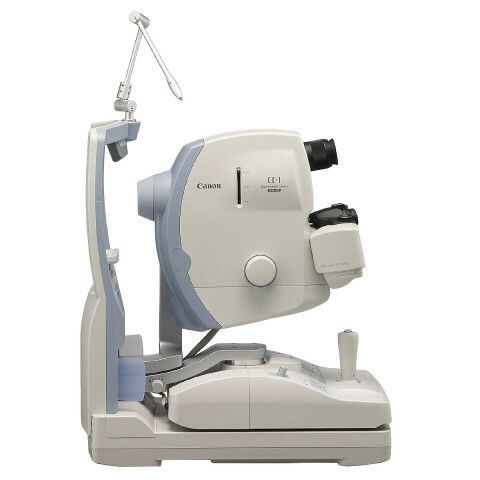 The CX-1 provides the small pupil photography function for patients whose eyes are difficult to dilate.Using the function, it can take photographs dilated pupils with a diameter of at least 4.3 mm and non-dilated pupils with a diameter of at least 3.8 mm. With the Retinal imaging control software (called “control software” below), images photographed by theCX-1 can be browsed, processed, stored, output to the DICOM storage server, exported to DICOM files,and output to a printer.